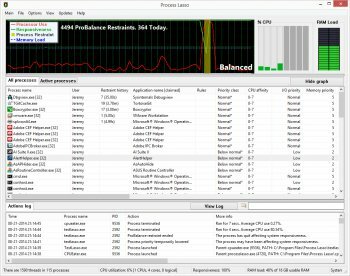 Process Lasso is a unique new technology that improves PC responsiveness during high CPU loads. It does this through dynamic adjustments to process priorities. This feature is called ProBalance, dynamic priority optimization. Instead of boosting foreground priorities, which is ineffective and potentially detrimental, Process Lasso temporary lowers the priorities of select background processes when they may be interfering with system responsiveness. A graphical demo is available on Bitsum's site that demonstrates how this feature can save you from a total PC stall in a worst case scenario. For more advanced users, Process Lasso allows automation and persistence of various process settings. One can set save CPU affinities, process priority classes, I/O priority, memory priorities, and application power profiles. These settings get re-applied each time the process is run. Users can also limit the number of instances an application can have, or disallow processes from running entirely. More advanced watchdog rules can be created to take any number of actions based on quotas and thresholds. For instance, trim the working set when a process's working set exceeds a specified amount, or lower the process priority class when an application exceeds a particular amount of CPU utilization for a specific duration. If you have an understanding of its functions, you would know the answer to that. Who is dumb enough to put this on a server? DISCLAIMER: I am the author. I do not mean to skew the rating, but also don't want to rate my own software badly ;o. This is Bitsum Technologies Server Edition of Process Lasso. I encourage those with terminal, web, or other servers to give it a try. It really does help to keep unruly processes from affecting the responsiveness of your server. This is the ideal application for Process Lasso, and having a separated core engine that can run as a service is icing on the cake. Unfortunately, its not as free as the consumer license. However, if any small business can not afford a license, email me and we will work something out.